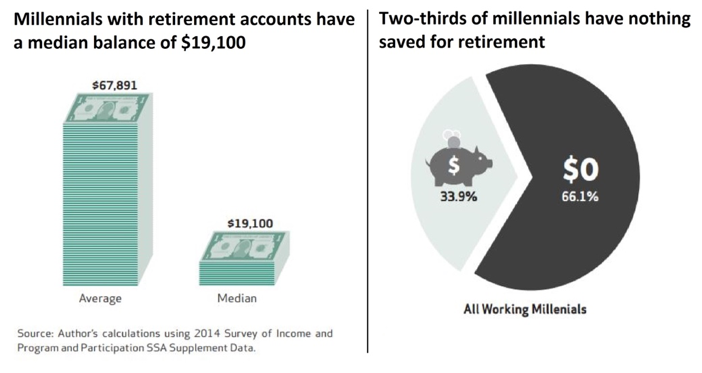 IWF - Millennial Monday: When should a millennial start saving for retirement? Millennial Monday: When should a millennial start saving for retirement? Currently, the average retirement age is 62 years old—which is a whole decade younger than the expected millennial average retirement age, 72 years old. I believe an increase of student loan debt could explain this trend. Compared to older generations, millennials are living in a different financial environment that makes it harder to start saving. Financial website The College Investor found that the Class of 2016 millennials enter the workforce with an average of $37,172 in student loan debt—compared to just $14,700 average student loan debt for Generation X. With simple budgeting tricks, there seems to still be hope for millennials’ retirement funds. CNBC reports, “Even if you’re like most millennials and have student loan debt, that doesn’t automatically preclude you from retiring early." Starting simple like tracking your spending and opting for cheaper housing will go a long way. At such a young age, saving for retirement may not seem like a priority. At the same time, we all want to be able to afford a relaxing retirement. The earlier millennials start saving, the better!